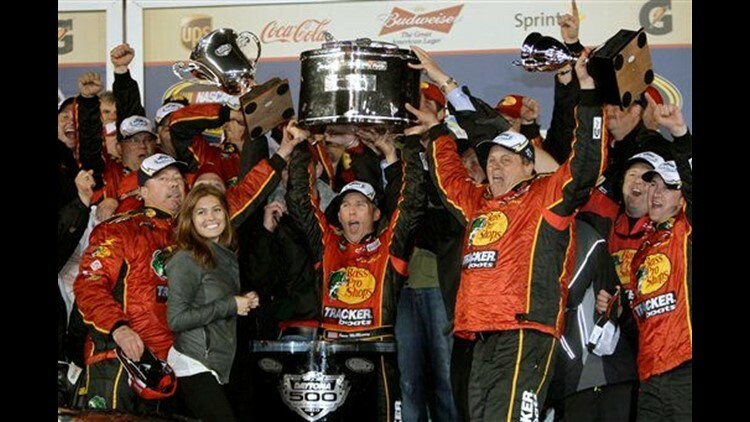 DAYTONA BEACH, Fla. (AP) — Anyone who managed to stick with the Daytona 500 through more than two hours of delays because of a pesky pothole were rewarded with a fantastic finish: Jamie McMurray held off hard-charging Dale Earnhardt Jr., then broke down in tears in Victory Lane. McMurray climbed out of his car and dropped to his knees in the infield grass. The sobbing started minutes later, and still flowed even when he reached his postrace interview. "You know, you do something that you love, you want to share that with the people you love," McMurray said, his voice cracking. "You can see how I feel." McMurray started sweating on the final lap when he saw Dale Earnhardt Jr.'s car looming larger and larger in his rearview mirror. Of all the guys bearing down on him, McMurray couldn't believe it was the one driver who seems destined to win at Daytona. Then McMurray looked up at the finish line. I don't think he can beat me to it, he thought. Turns out McMurray was right. Just barely. The truth — the hole truth — is that McMurray won the Super Bowl of NASCAR on Sunday in a spectacular finish. Race officials just hope it makes fans forget about a pothole on the track that required two stoppages and delayed stock car racing's greatest spectacle by more than two hours. Those who turned away missed an amazing show. "I can't really put it into words the way it feels," said McMurray, who broke down in tears several times after the race. "I'm trying to be genuine and as sincere as I can and not sound cliche: As a kid growing up, this is what you dream of, of being able to win the Daytona 500." McMurray did it with a huge push from former teammate Greg Biffle to move past leader Kevin Harvick on NASCAR's second attempt at a "green-white-checkered" finish — a two-lap overtime policy that was tweaked this week to create exciting finishes. It worked. Once out front, McMurray still had to contend with Earnhardt, a 12-time Daytona winner who was bearing down on his rear bumper. When he beat him to the finish line by 0.119 seconds, McMurray climbed from his car, sprinted to the race logo in the infield grass, and dropped to his knees in a tear-soaked celebration. "Fans deserve probably more of a show, so that's what they got," said Earnhardt, who settled for second. Because the drivers weren't positive the patch of pavement between turns 1 and 2 could hold, they couldn't risk holding back after the second repair. It was possible that the track would split again over those final 80 miles, and the race would be called before its conclusion. So the drivers beat and banged their way through the field in a white-knuckle final 32 laps. Then a flurry of late-race accidents created three two-lap sprints. It was that final segment that was so breathtaking, in part because of Earnhardt's unbelievable moves. In 10th on the final restart, he weaved in and out of traffic, shoved his Chevrolet into three-wide lines, and eventually moved himself into position to win. It was vintage Earnhardt, and McMurray was terrified to see him gaining ground. "I looked in my mirror and saw the 88 — I'll be honest, I was like, 'Crap, this guy has won a lot of races here. His family has an incredible history here,'" McMurray said. "I believe everything happens for a reason. I just was like, 'I hope this isn't his turn to win the Daytona 500, I hope this is mine.'" But with just two laps to make up so much ground, Earnhardt ran out of time and had to settle for second as McMurray sailed to his first career Daytona 500 victory. "I was happy for him. He deserves it. They've been through a lot. It's a great team." The end left McMurray sobbing with joy in Victory Lane during the celebration with his Earnhardt Ganassi Racing team. Between photographs, he rested his head on the trophy he cradled in his arms. It was McMurray's first race back with Chip Ganassi and Felix Sabates, who gave him his Sprint Cup Series shot in 2002. But McMurray bolted for a high-profile job with Roush Fenway Racing, where he spent four frustrating seasons before losing that ride at the end of last season when NASCAR forced Roush to drop a team to meet its four-car limit. "I'm not quitting again," he told Ganassi hours after the 500 victory. "Just so you guys know, I'm staying." McMurray had to fight to get a seat back with Ganassi, and it included convincing sponsor Bass Pro Shops' owner Johnny Morris to take a chance on him. He helped his cause with an October win at Talladega while driving for Roush, and the rehiring was announced a few weeks later. The risk was well rewarded Sunday with the biggest victory of McMurray's career. "It's unreal," McMurray said. "You know, to be where I was last year and for Johnny Morris and Chip and Felix. What a way to pay them back. It's just very emotional." Biffle, a close friend of McMurray's, was disappointed in finishing third because he was the leader when the caution came out after the first green-white-checkered attempt. But he was able to give McMurray the push that got his buddy into Victory Lane. "I just made my move too soon, a mistake on my part probably," Biffle said. "This is a big, big win for anybody's career. You got to be happy for anybody that ever wins this race. I was especially happy, the guys I was up there beating and banging with, you know, I would rather see Jamie win than those guys." Clint Bowyer finished fourth and was followed by David Reutimann and Martin Truex Jr. — teammates for Michael Waltrip, who finished 18th in what's expected to be his final Daytona 500. Kevin Harvick was seventh and was followed by Matt Kenseth, last year's race winner, Carl Edwards and Juan Pablo Montoya, McMurray's teammate. After the race, DIS president Robin Braig apologized for the hole and the delays that caused some fans to head to the exits long before the finish. "We're the World Center of Racing. This is the Daytona 500. This is not supposed to happen, and I take full responsibility," Braig said. "We can come back from this. We know how to fix it. This is hallowed ground. We understand that. We accept the responsibility."